A villa that has been accurately restored respecting the original architectural elements whilst providing modern comforts. It offers a suitable place for enjoying your holiday in a very calm zone. In the north of Mallorca, for 6 people and 3 bedrooms all with bathroom en suite, a fantastic garden with a swimming pool and Jacuzzi. All the bathrooms are in suite with shower, over and wc. The living room has great large windows to see the fantastic garden and swimming pool. It's equipped with TV, satellite, DVD, CD player and internet wifi. It includes a great sofa and an armchair too. The kitchen is totally equipped with refrigerator, oven, vitroceràmica, dishwasher, microwave, coffee pot, toaster and other utensils. You can practise golf at Golf Pollença. 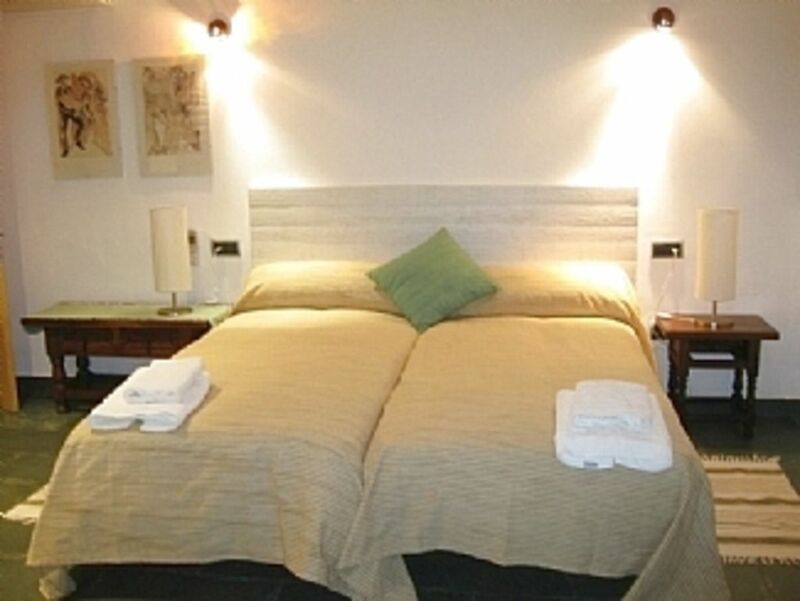 Is situated around 3km from the villa. The ground floor is totally adapted for handicapped people. Notes on accommodation: All the bedrooms have air conditioning and heating. Outside: The most beautiful of this villa, is undoubtedly the big garden where you will be able to rest, sunbathe, and be able to swim in the big swimming pool without clorine. You could relax in the Jacuzzi and sauna or practice ping pong or cycling (bicycles available). The villa has covered parking, barbecue, laundry and another outside bathroom too. Cleaning / Towels / Linen / Maid service: Towels and linen bed are included. Our second successive year visiting the villa, but sadly the weather proved more challenging with heavy thunderstorms and flash flooding. The villa survived most of this, with minor issues being electrics and some leaks. We even used the sauna this year! Margarilda and Joan were as helpful as ever, and the upgraded double bed was greatly appreciated. Similarly, we appreciated the upgrades to the furniture around the pool, and also to some of the pool toys. Hello Tony & family, yes there were two difficult weeks in Mallorca this october. The heavy rainy have done a lot damage in some areas. We survive very fine. We hope in next visits the wheather will be better. We've been delighted to have you in Villa Santuiri again. A lovely villa with pool, air conditioning in 3 bedrooms which is needed, but you do need a car which is not a problem as it saves on taxis. Have just returned from our holiday in Mallorca. The villa was amongst the best we have stayed in, with an excellent pool and well thought out external space, with well maintained gardens a real bonus. Internally everything worked and was presented in a clean condition; a pleasant surprise to get a bedding change part way through the holiday. Good supply of novels to keep us busy also! Joan and Margilda work hard and are both very friendly. Only negatives are minor points really - we didn't eat much outside as the table was at the other end of the pool/garden (and there were lots of mozzies!). The double bed could also be larger if that is supposed to be the master bedroom - we ended up pushing two of the singles together in the downstairs bedroom. Other than these minor points a well maintained villa in a convenient location for Pollensa and the northern beaches. A lovely villa in a tranquil location of real Spain. Wonderful relaxing villa nestled between the mountains so peaceful and relaxing. Great location in authentic rural Spanish location with all amenities close by. Joan the host was so friendly helpful and the house was extremely clean and modern with a traditional twist. Sauna an added bonus. Highly recommended! The villa was much better than expected, various spacious, and relaxing. In a very quiet spot, with beautiful views of the surrounding mountains. It's walkable along a road rather than pathway to Pollenca in approx 20 Mins. Villa was very clean and comfortable, we had no problems. There is tree house too, table tennis, hammock, bbq area. Highly recommend for relaxing get away from it all. It's a short drive Pollenca or Puerto Pollenca for evening meals, or lidl nearby for the bbq! Many thanks for the review. We have been delighted to have you in villa Santuiri. Pollença has an important classical music festival every summer. The 2nd August Pollença live the traditional Morocos and Cristians. You can find beaches at 5km from the villa in Pto Pollença(10 minuts driven distance) and 7km to Cala Sant Vicente where you can enjoy beautiful beaches with lovely water. The airport of Mallorca is situated in Palma, around 55km from the villa. You normally need 50 minuts to drive from Palma to Pollença. The car is recommended in Mallorca because there are a bad public transport. The villa is situated 1.5km to the nearest village (Pollença) and 6km to Pto Pollença. Alcudia is stuated around 10 km. In Pollença and Pto Pollença you can find all the services you could need like a supermarkets, shops, restaurants and banks. You can find the museum and monuments too. Changeover Day: We prefer changeover day on Saturday but we can be flexible in low season Notes on prices: Discounts for long estancies.